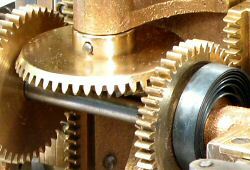 This "Technical and Reference" section includes a variety of technical notes, mechanism descriptions, repair instructions, and reference material that goes beyond the basic information on a machine's make and model. The notes were written originally for my own use, to assist me in understanding (and remembering) the technology and the operation of the machines in my own collection. They are based primarily on my own observations, often involving reverse-engineering of both hardware and software, and supplemented by published manuals, patent descriptions, and third-party data. The amount and type of detail varies, depending on how keen I was to get to the bottom of things. The calculators described here range from 30 to more than 100 years old, and may reasonably be considered a part of the historical record. These technical notes are presented in the hope that they will assist others in the understanding and preservation of this important part of our engineering heritage. While I believe my descriptions to be substantially correct, I do not guarantee that they are entirely accurate or complete, or even applicable to any other machine. I accept no responsibility for any consequences arising from their use by others. If you are planning to repair or rebuild a calculator, please read the Notes on overhauling a mechanical calculator before commencing, especially the section on taking your own notes. Please do not disassemble your machine in the expectation that my notes alone will get it back together! I would be happy to receive corrections, further information, or technical enquiries from like-minded enthusiasts. The following pages provide illustrated technical descriptions of the internal mechanisms of a selection of mechanical calculators. While the descriptions are obviously based on a specific example, they are often equally applicable (at least in principle) to other models from the same manufacturer. The following pages provide detailed step-by-step instructions for the complete disassembling and rebuilding of several common mechanical calculators. The instructions are based entirely on my own experiences in rebuilding a significant number of machines of each type. These are the procedures that I use, and they work well for me. If they work for you (and especially if they don't), or if you know of the original factory procedures, or of methods more suitable for an amateur workshop, I would welcome your feedback via the Enquiry form. The following pages describe the internal construction and operation of a selection of early electronic calculators. Last Updated: 9 September 2018.